Innovation to power your association. Engage Members. Streamline Operations. Grow Revenue. ClearVantage: The innovative and complete AMS solution. Our experienced team is here to walk you through the process of adopting a new state-of-the-art Association Management Software (AMS). Contact us today to schedule a demo or learn more about our products. Why do so many leading associations trust Euclid as their AMS provider? "We worked closely with the Euclid team to examine our business processes and ultimately implemented solutions that are truly incredible. Our members now have a web experience that speaks to their interests, and we are better equipped to tailor our offerings to our diverse membership. "The Euclid team is truly top notch at every level of engagement. Having a partner like Euclid has helped our organization in so many ways and they are always there to assist with any issue. Support from this team has surpassed my expectations and the results have been on average... outstanding! Hats off to Euclid for its brilliance, great support and for building such an amicable relationship. Euclid’s products are the most innovative, user friendly and comprehensive in the industry. Euclid provides a complete solution, ClearVantage, built from the ground up to meet the needs of today’s cutting-edge associations. ClearVantage allows users, whether staff or members, to access the information they need whenever and wherever they need it. Euclid has led the industry in innovation since our founding, and we continue to do so today. Having the best, most innovative product is just the starting point for achieving the exceptional ROI that Euclid’s clients experience. Euclid’s service and support operations, based 100% in the USA, collaborate with clients to ensure they get a tailored solution that meets their specific needs and objectives. Clients have access to a wealth of information through Euclid’s client support portal, and our knowledgeable and friendly ongoing support team is always there when clients need us. The ability to continuously innovate and provide exceptional service is made possible by the dedicated, talented, motivated and experienced people that make up the Euclid team. The Euclid culture fosters innovation, collaboration and team work. Our leadership team collectively has over 100 years of experience providing technology solutions to nonprofits and associations. Euclid's team members also have worked at leading corporations and technology companies, allowing us to bring in ideas and best practices from every segment. Euclid has a relentless commitment to each client’s success and this commitment is embodied in everything we do, from product development to implementation to post-implementation training and support. As a private employee-owned company (i.e., we are not owned by a hedgefund! ), Euclid is able to make decisions that are focused on delivering what our clients need to succeed. Our relentless commitment to our clients is evidenced by Euclid's industry leading 97% client retention rate and highest rate of client satisfaction. 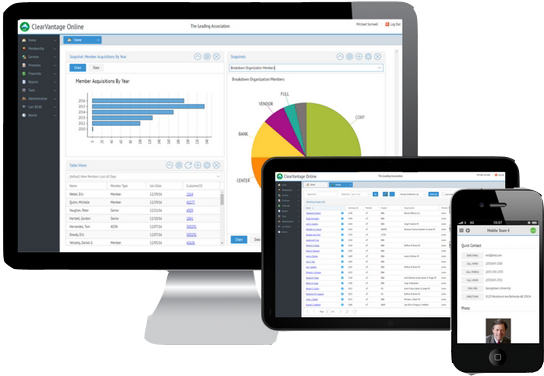 Interested in getting the best Association Management Software (AMS) solution for your organization? This step-by-step guide outlines the process and includes resources to help you along the way! The first step is to understand what a robust AMS system can do for your association. To learn more, click here to download our "What is an AMS?" guide! Document your goals and needs. Once you're ready,send your requirements or RFP to us! Now that you know what your organization needs, schedule a tailored demo to see how ClearVantage can work for your you. Once you make your AMS selection, the implementation process begins! Learn more about Euclid's rapid, thorough and proven SystemOne implementation process. Below is a combined list of our current integrations and partnerships. Learn more about our API here. Follow us on social media to stay updated on the latest news from the Euclid team! Designed, Developed and Supported in the U.S.A.